As of June 30, 2017, the aggregate market value of the registrant's common stock held by non-affiliates of the registrant was approximately $1,149,428,068 based on the closing sale price as reported on the New York Stock Exchange. As of February 23, 2018, there were 49,500,661 shares (including 904,614 shares of non-voting restricted shares) of the Registrant's common stock, par value $0.01 per share, outstanding. Portions of the Registrant's definitive Proxy Statement for its 2017 Annual Meeting of Stockholders are incorporated by reference into Part III of this report on Form 10-K to the extent stated therein. Knoll, Inc. (“Knoll,” the “Company,” “we,” “us,” “our”) is a leading manufacturer of commercial and residential furniture, accessories and coverings. We are a constellation of design-driven brands and people working with clients to create inspired modern interiors. Simply stated, we provide the furnishings and materials to help people enjoy their workplaces and homes. Our businesses share a reputation for high-quality and sophistication forming a diversified portfolio that sustain throughout evolving trends and perform throughout business cycles. To the architects and designers we work with, to our clients in the commercial, education, healthcare and government sectors, and to the many consumers we reach, Knoll represents a commitment to innovative solutions and an unmatched heritage of modern design. How people live and work is constantly being reshaped by changing technology and lifestyle trends. Our founders, Hans and Florence Knoll, believed in the power of design to enhance people’s lives. Since our founding 80 years ago, Knoll has won a place in iconic settings and in museums worldwide, earning numerous design honors and awards. Today, we have an unsurpassed collection of classic products to introduce, and reintroduce, as well as groundbreaking new designs. We enjoy strong relationships with many of today’s celebrated furniture and industrial designers, and a reputation that attracts talented new designers. Together, we work with customers to create inspired settings for work, education, hospitality and living. We focus on two distinct “to-the-trade” specifier markets, commercial and residential. Commercial, the largest portion of our business, is where we see strategic opportunities through the expansion of underpenetrated categories and ancillary markets. At the same time, in the residential market, we are expanding further into consumer and decorator channels worldwide. We reach customers primarily through a broad network of independent dealers and distribution partners, our direct sales force, our showrooms, and our online presence. We manage our business through our reporting segments: Office, Studio, and Coverings. All unallocated expenses are included within Corporate. When we refer to our “Specialty” products or businesses, we are referring collectively to our Studio and Coverings segments. The Office segment includes a complete range of workplace products that address diverse workplace planning paradigms. These products include systems furniture, seating, storage, tables, desks and KnollExtra® accessories, as well as the international sales of our North American Office products. KnollStudio® products, including iconic seating, lounge furniture, side, cafe and dining chairs as well as conference, training, dining and occasional tables. DatesWeiser, known for its sophisticated meeting and conference tables and credenzas, setting a standard for design, quality and technology integration. HOLLY HUNT®, known for high-quality residential furniture, lighting, rugs, textiles and leathers. HOLLY HUNT® includes Vladimir Kagan Design Group (“Vladimir Kagan”), a renowned collection of modern luxury furnishings. Knoll Europe, which distributes both KnollStudio and Knoll Office products. The Coverings segment includes KnollTextiles®, Spinneybeck® (including Filzfelt®), and Edelman® Leather. These businesses provide a wide range of customers with high-quality fabrics, felt, leather and related architectural products. The Corporate function represents the accumulation of unallocated costs relating to shared services and general corporate activities including, but not limited to, legal expenses, acquisition expenses, certain finance, human resources, administrative and executive expenses and other expenses that are not directly attributable to an operating segment. Dedicated, direct selling, general and administrative expenses of the segments continue to be included within segment operating profit. As we continue to grow both organically and through acquisitions, the central support of the Corporate function will evolve and grow as well. For further information regarding our segments see the section below, and Note 20 in the accompanying financial statements. We draw on our constellation of businesses to provide products and designs that meet the needs of our customers. Our offerings range from our classic signature pieces to our ancillary products which include the Rockwell Unscripted collection by The Rockwell Group and in 2018, will include the product portfolio of our most recent acquisition of Muuto; from dramatic fabrics, to Filzfelt architectural products for acoustical control. We solve a variety of needs for each customer, and our goal for each engagement is to maximize the opportunity from the start. To that end, we have undertaken strategic programs to better synchronize our teams and resources to deliver a single compelling customer experience. We also are investing in systems and tools for our dealer partners to make it easier to do business with Knoll. Our growth strategy also focuses on specific international markets where we can significantly build our share, such as Canada, Mexico, Europe, the Middle East, and selected underpenetrated areas across the globe where there is a concentration of discerning clients. Maximizing the sales growth and profitability of Office, our largest segment, has been a continuing priority. With respect to growth in our Office segment, a variety of initiatives will contribute to making this growth possible: broadening our workplace products portfolio; enhancing strategic sales coverage, including a focus on global accounts; and strengthening our Knoll dealer distribution network. At the same time, we aim to increase profitability through operational improvements and investments in our infrastructure. Our lean manufacturing initiative, combined with continued modernization of our facilities, is allowing us to progressively deliver on this goal. The commercial market has shifted dramatically in the last decade. As clients are readdressing the relationship between individual and collaborative workspaces, they are reducing the footprint of individual workstations and investing in more ancillary furniture. Knoll is committed to maintaining our leadership in open-plan workspaces and private offices, while inventing and innovating new ways for people to work. Our constellation of businesses positions us well to deliver in the evolving work environment, where people choose how and where they work throughout the day, as the traditional boundaries between residential and commercial products blur, and the importance of a total environment outshines any one particular element. We are looking beyond traditional office product categories - systems, task seating and storage - to furniture for activity spaces and the in-between spaces where people meet. We believe that our success in our traditional office products gives us an advantage throughout the workplace. As we design new products suited to flexible spaces, we are also responding to demands at different price points with different materials and finishes. Our new Rockwell Unscripted collection, received enthusiastically at the 2016 NeoCon® national industry tradeshow, addresses the idea of a hospitality work experience. Rockwell Unscripted brings a sense of theater and play to the workplace, putting people at the center of the work life experience and creating a warm and welcoming place where people want to be. The collection encompasses six product categories ranging from seating and lounge to architectural walls and storage. It addresses those needs holistically for organizations that seek alternatives to the traditional workspace. With the evolution from individual workstations to collaborative spaces and ancillary products, Knoll is not only expanding the breadth of our offerings through our constellation of brands but also strengthening our presence in the marketplace. We are continuing to partner with our dealers to ensure our customers understand that Knoll provides not just systems or workstations and work chairs but rather a complete family of complementary ancillary products. Together, we are meeting the demands of our customers while capturing more of their total spend and elevating the profitability of our engagements. This approach has served as a catalyst for dealers to invest in their spaces. Their showrooms are becoming extensions of our own, offering not just product showcases but places to find new integrated solutions from all of Knoll, such as Filzfelt architectural solutions and coverings. Dealers help people to understand workplace needs and planning capabilities, and Knoll is providing more of the training and education that helps them add value and increase their profits when they sell Knoll. Our principal Knoll Office product lines, described below, include systems furniture, seating, storage, tables, desks and KnollExtra® ergonomic accessories. The Office segment comprised approximately 60.3% of our sales in 2017, 62.8% of our sales in 2016, and 62.2% of our sales in 2015. Our office systems furniture encompasses a range of architect and designer-oriented products at different price levels, with a variety of planning models and product features. Systems furniture comprises integrated panels or table desks, work surfaces and storage units, power and data systems, and lighting. These components can be moved, re-configured and re-used to create flexible, space-efficient work environments, tailored to each organization's personality with wide range of laminates, paints, veneers and textiles. Knoll systems can adapt to virtually any office environment, from team spaces to private executive offices. Through product line enhancements for clients to add to their installations, and through integration with other Knoll lines, we maximize the long-term value of their investment in Knoll. We constantly research and assess the general office seating market, and develop work chairs that enhance Knoll’s reputation for ergonomics, aesthetics, comfort and value. The result is an increasingly innovative, versatile seating collection consistent with the Knoll brand. Clients evaluate work chairs based on ergonomics, aesthetics, comfort, quality and affordability-all Knoll strengths. We offer market leading, high quality office chairs at a range of price points, performance levels and materials. Our files and storage products, featuring the Template®, Calibre® and Series 2TM product lines, are designed with unique features to maximize storage capabilities throughout the workplace. Our core files and storage products consist of lateral files, mobile pedestals and other storage units, bookcases and overhead cabinets. Knoll launched AnchorTM in 2013, a streamlined collection of user-friendly storage that addresses users’ organizational needs in the changing workplace. The range of files and storage augments our product offering, allowing clients to address all of their office furniture needs with us, especially in competitive bid situations where Knoll systems, seating, tables and desks have been specified. The breadth of the product line also enables our dealers to offer stand-alone products to businesses that have smaller storage requirements. Files and storage are available in a wide range of sizes, configurations and colors, which can be integrated with other manufacturers' stand-alone furniture. In addition, some elements of the product line can be configured as freestanding furniture in private offices or open-plan environments. We offer collections of adjustable tables as well as meeting, conference, training, dining, stand-alone and table desks. Our Tone™, Upstart® and Antenna® Simple Tables product lines include adjustable, work, meeting, conference and training tables. In 2014, we introduced Tone™, a comprehensive collection of height-adjustable tables compatible with the Dividends Horizon, Antenna Workspaces, and Reff Profiles systems. Tone™ features a wide range of support and adjustment options that integrate seamlessly with Knoll open plan, private office and activity spaces furniture, or are used independently to create flexible work areas. We also expanded the Reff Profiles product line with a series of meeting tables. Our k. stand height -adjustable tables which are easy to specify, assemble and use offer an expanded price point option for today's office needs. KnollExtra offers accessories that complement Knoll office furniture products, including technology support accessories, desktop organizational tools, lighting and storage. KnollExtra integrates technology comfortably into the workplace, with flat panel monitor supports and central processing unit holders that deliver adjustability and save space. Sapper Monitor Arm Collection, designed by renowned industrial designer Richard Sapper, offers a clean, modern solution to technology challenges in the modern workplace; the collection is now in the permanent collection of New York's Museum of Modern Art. KnollExtra also includes marker boards, free-standing and mounted LED lighting and other technology support for the changing workplace. Our Studio segment is comprised of KnollStudio, HOLLY HUNT®, KnollEurope and DatesWeiser. The Studio portfolio includes lounge seating; side, cafe and dining chairs; barstools; and training, conference, dining and occasional tables. KnollStudio includes many of our best-known furnishings, making Knoll a renowned source of classic modern and contemporary design. HOLLY HUNT® designs, produces and showcases high quality products such as residential furniture, lighting, rugs, textiles and leathers. Our Knoll Europe business offers products designed specifically for the European market, in addition to many of our popular KnollStudio and Office products. DatesWeiser, designs and produces sophisticated meeting and conference area tables known for high quality and technological integration. KnollStudio has a long history of working with celebrated architects and designers from around the world, including Ludwig Mies van der Rohe, Marcel Breuer, Harry Bertoia, Eero Saarinen, Isamu Noguchi, Warren Platner, Frank Gehry, Maya Lin, Jens Risom, Richard Schultz, and Kazuhide Takahama. In addition, KnollStudio manufactures a collection of original furniture designs by Florence Knoll. Their iconic designs often draw designers and customers into the larger Knoll constellation of brands. The KnollStudio strategy is to both maintain and mine revered masterpieces-reintroducing those that were discontinued and are now mid-century classics, and keeping others refreshed and relevant for contemporary audiences. We enrich this heritage by collaborating with such leading contemporary designers as Mark Krusin, Marc Newson and David Adjaye, to create future classics for residential and commercial markets. Our principal KnollStudio product lines include seating, lounge furniture, side, café and dining chairs as well as conference, training and occasional tables. While KnollStudio designs represent different viewpoints and eras, they all embrace a modernist aesthetic. As a result, designers can integrate our ensemble of products into harmonious and inspiring settings furnished entirely with Knoll. With the trend towards residentially-inspired workplaces, KnollStudio products have gained cross-over appeal between residential and commercial settings. KnollStudio offers unparalleled quality for workplaces, homes, hotels and restaurants, as well as government and educational institutions. To expand our audiences, our flagship Knoll Showroom in New York City and our knoll.com website reach retail consumers and designers alike. Our Knoll Space retail sales program brings consumers the best of Knoll furnishings for their home and home office, through more than 50 specialty retailers and e-tailers, with collectively more than 90 locations in the United States and Canada. PixelTM is one our most recent KnollStudio offerings. Introduced in 2015 as part of the KnollStudio line, Pixel is a comprehensive collection of flexible, architecturally-inspired meeting tables. Its intuitive Pixel Connect system and a patent-pending flip mechanism make it simple to attach, separate and nest tables for various meeting and training applications. Pixel received the 2015 Best of Neocon Gold award in its category. Pixel allows access to power wherever needed, offering a range of electrical options and the innovative Pixel Link Power System which makes it easy to connect multiple power centers. As both a premier provider and distributor of furnishings, lighting, textiles and leathers, HOLLY HUNT® significantly expands our reach into the high-end, to-the-trade residential marketplace. Our strategy has been to extend the brand into a broader set of primary markets, opening new showrooms in Dallas, Houston, London and Los Angeles and expanding our product offerings. In 2016, HOLLY HUNT® acquired Vladimir Kagan Design Group, ensuring the legacy of the renowned designer’s iconic products for high profile interiors. Our Studio segment includes our KnollEurope business, consisting primarily of KnollStudio products, but drawing on the Knoll portfolio to give our customers a complete office environment. We also offer products designed specifically for the European market, such as the WaTM desk and storage system. Our presence in the European market positions us not only with local clients, but also with international clients who want to maintain their Knoll facility standard across offices worldwide. Our Studio segment includes DatesWeiser which designs, produces, and showcases high-end contemporary conference room and client-facing furniture. DatesWeiser's customers tend to be within the high design luxury markets. DatesWeiser's product offerings are similar in nature to Studio NA, Europe and Holly Hunt and specializes in high-end, quality furniture to fill the luxury market need. Studio accounted for approximately 30.1% of our sales in 2017, 27.8% of our sales in 2016, and 27.5% of our sales in 2015. Our Coverings segment consists of KnollTextiles, Spinneybeck | FilzFelt, and Edelman Leather. KnollTextiles continues to extend its distribution to reach new customers, notably through a KnollTextiles showroom in New York City's D&D building and through the knolltextiles.com website. Our KT Collection of upholstery marries classic modern design for everyday use, in a range of high performance patterns and textures at an affordable price. The company continues to win awards for its design excellence including Best of NeoCon® awards for eleven years running. Spinneybeck | FilzFelt is expanding from being just a supplier of raw material to being a provider of finished products. The same trends that have been transforming KnollOffice workspaces have created new opportunities for architectural products that offer flexible space divider panels and acoustic control. Spinneybeck has evolved from being an upholstery leather company to being a natural materials company that provides architects and interior designers with architectural and acoustic solutions. Filzfelt 100% wool felt, offered in 63 colors, meets the demand for new and renewable materials, and offers unique properties as an architectural and sound absorbing product. Now we provide not only felt panels, but also the track systems to hang them on, and are exploring innovative new uses of easy-to-install cork tiles for walls or ceilings. Finished architectural products such as these offer the opportunity for more large-scale orders than does upholstery alone. Edelman Leather offers beautiful, natural leathers by leveraging its US and London showrooms. Edelman successfully expanded beyond leather coverings in its Edelman showrooms by offering rug furnishings through its distribution partner Ruckstuhl, and in 2016 added Kyle Bunting, a unique Texas manufacturer of handcrafted, one-of-a-kind rugs. We are also developing new leather coverings for the hospitality business, offering quality within the financial constraints of today’s hotels and restaurants. The Coverings segment accounted for approximately 9.6% of our sales in 2017, 9.4% of our sales in 2016, and 10.3% of our sales in 2015. Our design philosophy and modern perspective reflects a historical commitment to partnering with preeminent industrial designers and architects to commercialize products that meet evolving workplace and residential needs. By combining designers' creative vision with our commitment to innovative materials and technologically advanced processes, we continue to cultivate brand loyalty among target clients. Our enviable history of nurturing the design process fosters strong, lasting relationships that attract the world's leading designers. In addition, these collaborations are consistent with our commitment to a lean organization and incentive-based compensation, by utilizing a variable royalty-based fee as opposed to the fixed costs typically associated with a larger in-house design staff. Our broad range of research, which explores the connection between workspace design and human behavior; health and performance; and the quality of the user experience, informs our product development initiatives. Our most recent research identified a new way to think about space, referred to as Immersive Planning, and contributed to the development of our most recent product launch - Rockwell Unscripted. In addition, our Office and Studio segments product development relies upon a New Product Commercialization Process to ensure quality and consistency of our methodology, reducing product development cycle time without sacrificing quality objectives. We use Pro/ENGINEER® solids modeling tools and rapid prototyping technology to compress development cycles and to improve responsiveness to special requests for customized solutions. Working closely with the designers during the early phases of development provides critical focus to yield the most viable products, balancing innovative modern design with practical function. Cross-functional teams are employed for all major development efforts with dedicated leaders who facilitate a seamless flow into manufacturing while aggressively managing cost and schedule opportunities. Increasingly, total environmental impact is factored into product material and manufacturing process decisions. Research and development expenses, were $19.2 million for 2017, $21.7 million for 2016, and $20.7 million for 2015. We generate sales with our direct sales force and a network of independent dealers, primarily in the Office segment, who jointly market and sell our products. We generally rely on these independent dealers to also provide a variety of important specification, installation and after-market services to our clients. Our dealers generally operate under short-term (one to three year), non-exclusive agreements. Our Studio and Coverings segments market and sell products with their own internal sales force that often work closely with our Office sales force. We also sell our KnollStudio products through a network of independent retailers. HOLLY HUNT and Edelman both operate a network of showrooms to market and sell their products. Our clients are typically Fortune 1000 companies, governmental agencies and other medium-to-large sized organizations in a variety of industries including financial, legal, accounting, education, healthcare and hospitality. Our Coverings segment also markets and sells products to private aviation, marine and luxury coach industries. Our direct sales force and independent dealers in North America work in close partnership with clients and design professionals to specify distinctive work environments. Our direct sales representatives, in conjunction with the independent dealers, sell to and call directly on key clients. Our independent dealers also call on many other medium and small sized clients to provide seamless sales support and client service. We have an over $11.5 billion installed base of office systems, which provides a strong platform for recurring and add-on sales. “Installed base” refers to the amount of office systems product we have sold in North America during the previous fifteen years. Our products and knowledgeable sales force have generated strong brand recognition and loyalty among architects, designers and corporate facility managers, all of whom are key decision-makers in the furniture purchasing process. Our strong relationships with architects and design professionals help us stay abreast of key workplace trends and position us to better meet the changing needs of clients. For example, we have invested in training all of our architect and designer specialists as Leadership in Energy and Environmental Design (“LEED®”) accredited professionals to help clients better address environmental issues that arise in the design of the workplace. We have aligned our sales force to target strategic areas of opportunity to include global accounts, health care, higher education and others. We have also placed sales representatives and technical specialists into certain dealerships to support programs such as Knoll Essentials, which is described below. We expanded our sales force by investing in a 15% increase to cover a more dispersed market which has shifted to include increased small to mid-size projects and fewer large projects. In addition to coordinating sales efforts with the sales representatives, our dealers generally handle project management, installation and maintenance for client accounts after the initial product selection and sale. Although many of these dealerships also carry products of other manufacturers, they have agreed not to act as dealers for our principal direct competitors. We have not experienced significant dealer turnover. Our dealers' substantial commitment to understanding our product lines, and their strong relationships with us, serve to discourage dealers from changing vendor affiliations. We are not significantly dependent on any one dealer, the largest of which accounted for approximately 4.6%, 3.5%, and 4.3%, of our North American sales in 2017, 2016, and 2015, respectively. As part of our commitment to building relationships with our dealers, we maintain the Knoll Essentials program. Knoll Essentials is a catalog program developed in response to dealer requests for a consolidated, user-friendly selling tool for day-to-day systems, seating, storage, and accessory products. The Knoll Essentials program includes dealer incentives to sell our products. We also employ a dedicated team of dealer sales representatives to work with our dealerships. Sales to U.S. and state and local government agencies, respectively, aggregated approximately 4.1% and 6.0%, respectively, of our consolidated sales in 2017. The U.S. government typically can terminate or modify any of its contracts with us either for its convenience or if we default by failing to perform under the terms of the applicable contract. Our global supply chain manufactures and assembles products to specific customer orders and operates all facilities under a philosophy of continuous improvement and lean manufacturing. Our Office Segment is supported by sites in Canada, Michigan and Pennsylvania. The Studio Segment is supported by sites in Illinois, Italy, New York, Pennsylvania and Texas. Sites in Connecticut, New York and Pennsylvania support our Coverings Segment. In addition, we utilize many third parties to produce a variety of our Office and Studio designs. We continue to look for ways to ensure that our manufacturing capabilities match our supply chain strategy providing the most value for Knoll. The root of our continuous improvement efforts lies in the philosophy of lean manufacturing that drives operations. As part of this philosophy, we partner with suppliers who can facilitate efficient and often just-in-time deliveries, allowing us to manage our raw materials inventory. We also utilize “Kaizen” work groups in the plants to develop best practices to minimize scrap, time and material waste at all stages of the manufacturing process. The involvement of employees at all levels ensures an organizational commitment to lean and efficient manufacturing operations. These projects improved customer responsiveness, quality and significantly improve productivity. In addition to the continued focus on enhancing the efficiency of the manufacturing operations, we also seek to reduce costs through our global sourcing effort. We have capitalized on raw material and component cost savings available through lower cost global suppliers. This broader view of potential sources of supply has enhanced our leverage with domestic supply sources, and we have been able to reduce cycle times by extracting improvements from all levels throughout the supply chain. The purchasing function in North America is centralized at the East Greenville facility for Office, KnollStudio, and Textiles. This centralization, and the close relationships with our primary suppliers, has enhanced our ability to realize purchasing economies of scale and implement “just-in-time” inventory practices. Steel, lumber, paper, paint, plastics, laminates, particleboard, veneers, glass, fabrics, leathers, upholstery filling material, aluminum extrusions and castings are used in our manufacturing process. Both domestic and overseas suppliers of these materials are selected based upon a variety of factors, with the price and quality of the materials and the supplier's ability to meet delivery requirements being primary factors in such selection. We do not generally enter into long-term supply contracts and, as a result, we can be vulnerable to fluctuations in the prices for these materials. No supplier is the only available source for a particular component or raw material. However, because of the specialization involved with some of our components, it can take a significant amount of time, money and effort to move to an alternate source. The markets in which we compete are highly competitive. We compete on the basis of (i) product design, including performance, ergonomic and aesthetic features; (ii) product quality and durability; (iii) relationships with clients, architects and designers; (iv) strength of dealer and distributor network; (v) on-time delivery and service performance; (vi) commitment to environmental standards by offering products that help clients achieve LEED® certified facilities and minimize environmental impact; and (vii) price. We estimate our share of the North American office furniture market in 2017 and 2016 was 7.4% and 7.0%, respectively. Some of our competitors, especially those in North America, are larger and have significantly greater financial, marketing, manufacturing and technical resources than us. Our most significant competitors in primary markets are Herman Miller, Inc., Steelcase, Inc., Haworth, Inc. and, to a lesser extent, Allsteel, Inc., an operating unit of HNI Corporation, and Teknion Corporation. These competitors have a substantial volume of furniture installed at businesses throughout North America, providing a continual source of demand for further products and enhancements. Moreover, the products of these competitors have strong acceptance in the marketplace. Despite our competitors strength in the marketplace, we believe that we have been able to compete successfully in the markets to date. Competition in the Studio and Coverings segments are much more fragmented than in the Office segment. Our Studio and Coverings businesses serve the mid-to high-end of the market, but compete against many companies, none of which has a dominant market share. We consider securing and protecting our intellectual property rights to be important to the business. We own approximately 49 active U.S. utility patents on various components used in our products and systems and approximately 101 active U.S. design patents. We also own approximately 371 patents in various foreign countries. The scope and duration of our patent protection varies throughout the world by jurisdiction and by individual product. In particular, patents for individual products extend for varying periods of time according to the date a patent application is filed, the date a patent is granted and the term of patent protection available in the jurisdiction granting the patent (generally 20 years from the date of filing in the U.S., for example). We believe that the duration of the applicable patents we are granted is adequate relative to the expected lives of our products. We own approximately 78 trademark registrations in the U.S., including registrations to the following trademarks, as well as related stylized depictions of the Knoll word mark: Knoll®, KnollExtra®, Knoll Luxe®, KnollStudio®, KnollTextiles®, Good Design Is Good Business®, Antenna®, Autostrada®, Calibre®, Currents®, Dividends®, Edelman® Leather, Modern Always®, Propeller®, Reff®, Sapper XYZ®, Spinneybeck® Leather, Toboggan®, Generation by Knoll®, Regeneration by Knoll®, MultiGeneration by Knoll®, Remix®, HOLLY HUNT®, GREAT OUTDOORS A HOLLY HUNT COLLECTION® and VLADIMIR KAGAN®. We also own approximately 296 trademarks registered in foreign countries. The scope and duration of our trademark protection varies throughout the world, with some countries protecting trademarks only as long as the mark is used, and others requiring registration of the mark and the payment of registration (generally ten years from the date of filing in the U.S., for example). In order to protect the indefinite duration, we make filings to continue registration of our trademarks. In October 2004, we received registered trademark protection in the United States for five iconic furniture designs by Ludwig Mies van der Rohe-the Barcelona Chair, the Barcelona Stool, the Barcelona Couch, the Barcelona Table and the Flat Bar Brno Chair. This protection recognizes the renown of these designs and reflects our commitment to ensuring that when architects, furniture retailers, businesses and individuals purchase a Ludwig Mies van der Rohe design, they are acquiring the authentic product, manufactured in accordance with the designer's historic specifications. Barcelona® is a registered trademark in the U.S., Canada and European Community owned by Knoll, Inc.
Our principal manufacturing operations and markets are in North America, and we also have manufacturing operations and markets in Europe. Our sales to clients and net property, plant and equipment are summarized by geographic areas below. Sales are attributed to the geographic areas based on the origin of sale. We believe that we are substantially in compliance with all applicable laws and regulations for the protection of the environment and the health and safety of our employees based upon existing facts presently known to us. Compliance with federal, state, local and foreign environmental laws and regulations relating to the discharge of substances into the environment, the disposal of hazardous wastes and other related activities has had and will continue to have an impact on our operations, but has, since 1990, been accomplished without having a material adverse effect on our operations. There can be no assurance that such laws and regulations will not change in the future or that we will not incur significant costs as a result of such laws and regulations. We have trained staff responsible for monitoring compliance with environmental, health and safety requirements. Our goal is to reduce and, wherever possible, eliminate the creation of hazardous waste in our manufacturing processes. While it is difficult to estimate the timing and ultimate costs to be incurred due to uncertainties about the status of laws, regulations and technology, based on information currently known to management, we do not expect environmental costs or contingencies to have a material adverse effect on our consolidated financial position, results of operations, competitive position, or cash flows. The operation of manufacturing plants entails risks in these areas, however, and we cannot be certain that we will not incur material costs or liabilities in the future which could adversely affect our operations. We have been identified as a potentially responsible party pursuant to the Comprehensive Environmental Response Compensation and Liability Act, or “CERCLA,” for remediation costs associated with waste disposal sites previously used by us. CERCLA can impose liability for costs to investigate and remediate contamination without regard to fault or the legality of disposal and, under certain circumstances, liability may be joint and several resulting in one responsible party being held responsible for the entire obligation. Liability may also include damages for harm to natural resources. The remediation costs and our allocated share at some of these CERCLA sites are unknown. We may also be subject to claims for personal injury or contribution relating to CERCLA sites. We reserve amounts for such matters when expenditures are probable and reasonably estimable. Knoll is committed to using materials and technology efficiently to conserve natural resources, developing energy-efficient processes; diverting waste generated by our operations and products; and protecting the health and safety of our associates and communities. Products that contribute to sustainable development include our GREENGUARD Children & Schools(SM) certified Generation and Remix families of chairs; and our BIFMA Level 3 certified Dividends Horizon and Antenna Workspace products. Each year we issue an Environmental Health & Safety Annual Report which tracks our pursuit of sustainability across all Knoll businesses. As of December 31, 2017, we employed a total of 3,402 people, consisting of 1,903 hourly and 1,499 salaried employees. The Grand Rapids, Michigan plant is the only unionized plant within North America and has an agreement with the Carpenters Union, Local 1615, of the United Brotherhood of Carpenters and Joiners of America, Affiliate of the Carpenters Industrial Council (the “Union”), covering approximately 203 hourly employees or 6.0% of the Company's labor force. The Collective Bargaining Agreement was entered into on May 1, 2015 and expires April 2018. From time to time, there have been unsuccessful efforts to unionize at our other North American locations. We believe that relations with our employees are good. Nonetheless, it is possible that our employees may continue attempts to unionize. Certain workers in the facilities in Italy are also represented by unions. Our annual report on Form 10-K, quarterly reports on Form 10-Q, current reports on Form 8-K and all amendments to those reports are made available free of charge through the “Investor Relations” section of our website at www.knoll.com, as soon as practicable after such material is electronically filed with or furnished to the U.S. Securities and Exchange Commission. Our product sales are tied to corporate spending and service-sector employment, which are outside of our control. Our sales and/or growth in sales would be adversely affected by a recessionary economy characterized by decreased corporate spending and service-sector employment. Our sales are significantly impacted by the level of corporate spending primarily in North America, which, in turn, is a function of the general economic environment. In a recessionary economy, business confidence, service-sector employment, corporate cash flows and non-residential commercial construction decrease, which typically leads to a decrease in demand for furniture and our other products. In addition, a recessionary economy may also result in saturation of the market by “just new” used office systems, leading to a decrease in demand for new office systems furniture. Sales of office systems, which have historically accounted for almost half of our revenues, represent longer term and higher cost investments for our clients. As a result, sales of office systems are more severely impacted by decreases in corporate spending than sales of seating, ancillary products, coverings, studio products, and demand for office systems typically takes longer to respond to an economic recovery. Geopolitical uncertainties, terrorist attacks, acts of war, natural disasters, increases in energy and other costs or combinations of such and other factors that are outside of our control could at any time have a significant effect on the economy, and, therefore, our business. The occurrence of any of these or similar events in the future could result in downward pressure on the economy, which we would expect to cause demand for our products to decline and competitive pricing pressures to increase. Weakness in the economy or uncertainty in the financial markets may adversely affect our results of operations and financial condition, as well as the financial soundness of our customers and suppliers. Weakness in the economy or uncertainty in the financial markets may inhibit our ability to access capital and could be restricted at a time when we would like, or need, to access financial markets. In addition, interest rate fluctuations, financial market volatility or credit market disruptions may negatively affect our customers' and our suppliers' abilities to obtain credit to finance their businesses on acceptable terms. As a result, our customers' needs and abilities to purchase our products or services may decrease, and our suppliers may increase their prices, reduce their output or change their terms of sale. If our customers' or suppliers' operating and financial performance deteriorates, or if they are unable to make scheduled payments or obtain credit, our customers may not be able to pay, or may delay payment of, accounts receivable owed to us, and our suppliers may restrict credit or impose different payment terms on us. Any inability of customers to pay us for our products and services, or any demands by suppliers for different payment terms, may adversely affect our earnings and cash flow. We may have difficulty increasing or maintaining our prices as a result of price competition, which could lower our profit margins. Our competitors may develop new product designs that give them an advantage over us in making future sales. We compete with our competitors on the basis of, among other things, price and product design. Since our competitors offer products that are similar to ours, we face significant price competition from our competitors, particularly in the Office segment. This price competition impacts our ability to implement price increases or, in some cases, maintain prices, which could lower our profit margins. Additionally, our competitors may develop new product designs that achieve a high level of customer acceptance, which could give them a competitive advantage over us in making future sales. Our efforts to introduce new products that meet customer and workplace requirements may not be successful, which could limit our sales growth or cause our sales to decline. To keep pace with workplace trends, such as changes in workplace design and increases in the use of technology, and with evolving regulatory and industry requirements, including environmental, health, safety and similar standards for the workplace and for product performance, we must periodically introduce new products. The introduction of new products requires the coordination of the design, manufacturing and marketing of such products, which may be affected by factors beyond our control. The design and engineering of certain of our new products can take up to a year or more and further time may be required to achieve client acceptance. In addition, we may face difficulties in introducing new products if we cannot successfully align ourselves with independent architects and designers who are able to design, in a timely manner, high-quality products consistent with our image. Accordingly, the launch of any particular product may be later or less successful than originally anticipated by us. Difficulties or delays in introducing new products or lack of customer acceptance of new products could limit our sales growth or cause our sales to decline. We may not be able to manage our business effectively if we are unable to retain our experienced management team or recruit other key personnel. The success of our business is highly dependent upon our ability to attract and retain qualified employees and upon the ability of our senior management and other key employees to implement our business strategy. We believe there are only a limited number of qualified executives in the industry in which we compete. The loss of the services of key members of our management team, including Andrew B. Cogan, our Chief Executive Officer, could harm our efforts to successfully implement our business strategy. We are dependent on the pricing and availability of raw materials and components, and price increases and unavailability of raw materials and components could lower sales, increase our cost of goods sold and reduce our profits and margins. We require substantial amounts of raw materials, which we purchase from outside sources. Steel, plastics, wood-related materials, and leather are the main raw materials used in our products. The prices and availability of raw materials are subject to change or curtailment due to, among other things, the supply of, and demand for, such raw materials, changes in laws or regulations, including duties and tariffs, suppliers' allocations to other purchasers, interruptions in production by raw materials or component parts suppliers, changes in currency exchange rates and worldwide price levels. We can be significantly impacted by price increases in these raw materials. Although no supplier is the only available source for a particular component or raw material, some of our products and components are extremely specialized and, therefore, it can take a significant amount of time and money to move from one supply source to another. Any failure to obtain raw materials and components on a timely basis, or any significant delays or interruptions in the supply of raw materials or components, could prevent us from being able to produce products ordered by our clients in a timely fashion, which could have a negative impact on our reputation and our dealership network, and could cause our sales to decline. We are affected by the cost of energy and increases in energy prices could reduce our margins and profits. The profitability of our operations is sensitive to the cost of energy through our transportation costs, the cost of petroleum-based materials, like plastics, and the cost of operating our manufacturing facilities. Energy costs have been volatile in recent years due to changes in global supply and demand. Although we have been successful in countering energy price increases, primarily through our global sourcing initiatives and continuous improvement programs, we have not been able to offset these costs entirely. We rely upon independent furniture dealers, and a loss of a significant number of dealers could affect our business, financial condition and results of operations. We rely on a network of independent dealers for the joint marketing of our products to small and mid-sized accounts, and to assist us in the marketing of our products to large accounts, particularly in the Office segment. We also rely upon these dealers to provide a variety of important specification, installation and after-market services to our clients. Our dealers operate, generally, under short-term, non-exclusive agreements. There is nothing to prevent our dealers from terminating their relationships with us. In addition, individual dealers may not continue to be viable and profitable and may suffer from the lack of available credit. While we are not significantly dependent on any single dealer, our largest dealer accounted for 4.6% of our North American sales in 2017; if dealers go out of business or are restructured, we may suffer losses as they may not be able to pay us for products previously delivered to them. The loss of a dealer relationship could also negatively affect our ability to maintain market share in the affected geographic market and to compete for and service clients in that market until a new dealer relationship is established. Establishing a viable dealer in a market can take a significant amount of time and resources. The loss or termination of a significant dealer or a significant number of dealer relationships could cause significant difficulties for us in marketing and distributing our products, resulting in a decline in our sales. Currently, one of our largest clients is the U.S. government, a relationship that is subject to uncertain future funding levels and federal procurement laws and requires restrictive contract terms; any of these factors could curtail current or future business. For the year ended December 31, 2017, we derived approximately 4.1% and 6.0% of our revenue from sales to U.S. and state and local government agencies, respectively. Our ability to compete successfully for and retain business with the U.S. government is highly dependent on cost-effective performance and compliance with complex procurement laws. Historically, federal procurement laws required government agencies to purchase furniture products from Federal Prison Industries, Incorporated. If these or similar laws would be re-instituted, it would make it more difficult for us to sell our furniture to agencies and departments of the U.S. government. In addition, the U.S. government typically can terminate or modify its contracts with us either for its convenience or if we default by failing to perform under the terms of the applicable contract. A termination arising out of our default could expose us to liability and impede our ability to compete in the future for contracts and orders. Furthermore, if we were found to have committed fraud or certain criminal offenses, we could be suspended or debarred from all further government contracting. Given the significance of our governmental business, we are sensitive to decreases in governmental spending. Federal, state and local government budgets have experienced deficits recently and are under significant pressure to reduce spending. These spending pressures have resulted in, and may continue to result in, decreased furniture spending, which has negatively impacted (and may continue to negatively impact) our governmental sales. Our efforts to diversify our sources of revenue may not be effective and may expose us to new risks. Historically, the majority of our revenues were derived from the sales of office systems in North America. We have pursued a strategy to diversify our sources of revenue and reduce our dependence on North American office system sales by, for example, growing our seating, international, ancillary and specialty businesses. While we believe that this strategy enables us to better maintain and grow our sales and profitability during cyclical ups and downs in the industry, there can be no assurance that this diversification strategy will be effective in achieving these goals. Our diversification strategy involves the continued expansion of our specialty businesses, and business growth internationally, which may expose us to business risks that we have not experienced. We also may incur significant costs in pursuing our diversification strategy, and those costs may not be fully offset by increased revenues associated with new business lines. We operate with leverage, and a significant amount of cash will be required to service our indebtedness. Restrictions imposed by the terms of our indebtedness may limit our operating and financial flexibility. As of December 31, 2017, we had total consolidated outstanding debt of approximately $192.0 million under our credit facility. On January 22, 2018, we amended and extended our existing credit facility ("Existing Credit Facility"), dated May 20, 2014, with a new $750.0 million credit facility maturing on January 23, 2023, consisting of a revolving commitment in the amount of $400.0 million, a US Dollar term loan commitment in the amount of $250.0 million, and a multicurrency term loan commitment of €81.7 million. The Amended Credit Agreement ("Amended Credit Agreement") also includes an option to increase the size of the credit facility or incur incremental term loans by up to an additional $250.0 million, subject to the satisfaction of certain terms and conditions. The Amended Credit Agreement is described in more detail in "Capital Resources and Liquidity" under Item 7 as well as in Note 12, Indebtedness, and Note 21, Subsequent Events, to the Consolidated Financial Statements under Item 8 of this Annual Report on Form 10-K.
•the terms of our credit facility also impose other operating and financial restrictions on us, which could limit our flexibility in reacting to changes in our industry or in economic conditions generally. Our Amended Credit Agreement prevents us and our subsidiaries from incurring any additional indebtedness other than (i) borrowings under our existing credit facility; (ii) certain types of indebtedness that may be incurred subject to aggregate dollar limitations identified in the credit facility, including, without limitation, purchase money indebtedness and capital lease obligations, indebtedness incurred in connection with a permitted acquisition, and loans obtained through an expansion of the facility, all of which cannot exceed $250.0 million at any time, and (iii) other types of indebtedness that are not limited to specific dollar limitations, such as indebtedness incurred in the ordinary course of business and unsecured, subordinated indebtedness. The aggregate amount of indebtedness that we may incur pursuant to these exceptions is further limited by the financial covenants in our credit facility and, therefore, will depend on our future results of operations and cannot be determined at this time. As a result of the financial covenants, our capacity under our credit facility could be reduced if our trailing consolidated EBITDA (as defined by our credit agreement) declines due to deteriorating market conditions or poor performance. Furthermore, although we may incur unlimited amounts of certain types of indebtedness, subject to compliance with these financial covenants, the amount of indebtedness that we may be able to incur will depend on the terms on which such types of debt financing are available to us, if available at all. As a result of the foregoing, we may be prevented from engaging in transactions that might further our growth strategy or otherwise be considered beneficial to us. A breach of any of the covenants in our credit facility could result in a default thereunder. If payments to the lenders under our credit facility were to be accelerated, our assets could be insufficient to repay in full the indebtedness under our credit facility and our other liabilities. Any such acceleration could also result in a foreclosure on all or substantially all of our subsidiaries' assets, which would have a negative impact on the value of our common stock and jeopardize our ability to continue as a going concern. We may require additional capital in the future, which may not be available or may be available only on unfavorable terms. Our capital requirements depend on many factors, including capital improvements, tooling, information technology upgrades and new product development. To the extent that our existing capital is insufficient to meet these requirements and cover any losses, we may need to raise additional funds through financings or curtail our growth and reduce our assets. Any equity or debt financing, if available at all, may be on terms that are not favorable to us. Equity financings could result in dilution to our stockholders, and the securities may have rights, preferences and privileges that are senior to those of our common stock. If our need for capital arises because of significant losses, the occurrence of these losses may make it more difficult for us to raise the necessary capital. An inability to protect our intellectual property could have a significant impact on our business. We attempt to protect our intellectual property rights, both in the United States and in foreign countries, through a combination of patent, trademark, copyright and trade secret laws, as well as licensing agreements and third-party nondisclosure and assignment agreements. Because of the differences in foreign trademark, copyright, patent and other laws concerning proprietary rights, our intellectual property rights do not generally receive the same degree of protection in foreign countries as they do in the United States. In some parts of the world, we have limited protections, if any, for our intellectual property. Our ability to compete effectively with our competitors depends, to a significant extent, on our ability to maintain the proprietary nature of our intellectual property. The degree of protection offered by the claims of the various patents, copyrights, trademarks and service marks may not be broad enough to provide significant proprietary protection or competitive advantages to us, and patents, copyrights, trademarks or service marks may not be issued on our pending or contemplated applications. In addition, not all of our products are covered by patents or similar intellectual property protections. It is also possible that our patents, copyrights, trademarks and service marks may be challenged, invalidated, canceled, narrowed or circumvented. In the past, certain of our products have been copied and sold by others. We try to enforce our intellectual property rights, but we have to make choices about where and how we pursue enforcement and where we seek and maintain intellectual property protection. In many cases, the cost of enforcing our rights is substantial, and we may determine that the costs of enforcement outweigh the potential benefits. If we are unable to maintain the proprietary nature of our intellectual property with respect to our significant current or proposed products, our competitors may be able to sell copies of our products, which could adversely affect our ability to sell our original products and could also result in competitive pricing pressures, which may negatively affect our profitability. If third parties claim that we infringe upon their intellectual property rights, we may incur liabilities and costs and may have to redesign or discontinue an infringing product. We face the risk of claims that we have infringed upon third parties' intellectual property rights. Companies operating in our industry routinely seek patent protection for their product designs, and many of our principal competitors have large patent portfolios. Prior to launching major new products in our key markets, we normally evaluate existing intellectual property rights. However, our competitors may have filed for patent protection which is not, at the time of our evaluation, a matter of public knowledge. Our efforts to identify and avoid infringing upon third parties' intellectual property rights may not be successful. Any claims of patent or other intellectual property infringement, even those without merit, could (i) be expensive and time consuming to defend; (ii) cause us to cease making, licensing or using products that incorporate the challenged intellectual property; (iii) require us to redesign, reengineer, or rebrand our products or packaging, if feasible; or (iv) require us to enter into royalty or licensing agreements in order to obtain the right to use a third party's intellectual property. We could be required to incur substantial costs to comply with environmental requirements. Violations of, and liabilities under, environmental laws and regulations may increase our costs or require us to change our business practices. Our past and present ownership and operation of manufacturing plants are subject to extensive and changing federal, state, local and foreign environmental laws and regulations, including those relating to discharges to air, water and land, the handling and disposal of solid and hazardous waste and the cleanup of properties affected by hazardous substances. As a result, we are involved from time to time in administrative and judicial proceedings and inquiries relating to environmental matters and could become subject to fines or penalties related thereto. We cannot predict what environmental legislation or regulations will be enacted in the future, how existing or future laws or regulations will be administered or interpreted or what environmental conditions may be found to exist. Compliance with more stringent laws or regulations, or stricter interpretation of existing laws, may require additional expenditures by us, some of which may be material. We have been identified as a potentially responsible party pursuant to the Comprehensive Environmental Response, Compensation and Liability Act of 1980, or CERCLA, for remediation costs associated with waste disposal sites previously used by us. In general, CERCLA can impose liability for costs to investigate and remediate contamination without regard to fault or the legality of disposal and, under certain circumstances, liability may be joint and several, resulting in one party being held responsible for the entire obligation. Liability may also include damages for harm to natural resources. The remediation costs and our allocated share at some of these CERCLA sites are unknown. We may also be subject to claims for personal injury or contribution relating to CERCLA sites. We reserve amounts for such matters when expenditures are probable and reasonably estimable. We are subject to potential labor disruptions, which could have a significant impact on our business. Certain of our employees located in Grand Rapids, Michigan and Italy are represented by unions. The collective bargaining agreement for our Grand Rapids location expires April 28, 2018. We have also had attempts to unionize our other North American manufacturing locations, which to date have been unsuccessful. We have experienced a number of brief work stoppages at our facilities in Italy as a result of national and local issues. While we believe that we have good relations with our workforce, we may experience work stoppages or other labor problems in the future, and further unionization efforts may be successful. Any prolonged work stoppage could have an adverse effect on our reputation, our vendor relations and our dealership network. Moreover, because substantially all of our products are manufactured to order, we do not carry finished goods inventory that could mitigate the effects of a prolonged work stoppage. Product defects could adversely affect our results of operations. Our customers may encounter product defects that could potentially arise in the course of our development of new products or due to manufacturing problems. If product defects do arise, we could incur product warranty costs, product liability costs and costs associated with recalling and repairing defective products. While we maintain a reserve for our product warranty costs based on estimates of the costs that may be incurred under the warranties on all of our products, our actual warranty costs may exceed this reserve, resulting in a need to increase the amounts accrued for warranty costs. We also maintain product liability and other insurance coverage that we believe to be generally in accordance with industry practices, but our insurance coverage does not extend to field visits to repair, retrofit or replace defective products, or to product recalls. As a result, our insurance coverage may not be adequate to protect us fully against substantial claims and costs that may arise from product defects, particularly if we have a large number of defective products that we must repair, retrofit, replace or recall. Sales of our products could be adversely affected by excessive warranty claims, product recalls and adverse perceptions of product quality. As a result of these factors, product defects could have a material adverse effect on our results of operations. We may be vulnerable to the effects of currency exchange rate fluctuations, which could increase our expenses. We primarily sell our products and report our financial results in U.S. dollars, but we generate some of our revenues and pay some of our expenses in other currencies. Paying our expenses in other currencies can result in a significant increase or decrease in the amount of those expenses in U.S. dollar terms, which affects our profits. In the future, any foreign currency appreciation relative to the U.S. dollar would increase our expenses that are denominated in that currency. Additionally, as we report currency in the U.S. dollar, our financial position is affected by the strength of the currencies in countries where we have operations relative to the strength of the U.S. dollar. The principal foreign currencies in which we conduct business are the Canadian dollar and the Euro. In addition, our January 2018 acquisition of Muuto will increase our foreign currency exchange rate exposure. Approximately 12.6% of our revenues in 2017 and 25.9% of our cost of goods sold in 2017 were denominated in currencies other than the U.S. dollar. From time to time, we review our foreign currency exposure and evaluate whether we should hedge our exposure. Pension costs or funding requirements could increase at a higher-than-anticipated rate. We administer two defined benefit pension plans, which hold significant amounts of equity securities. Changes in interest rates or other plan assumptions or in the market value of plan assets could affect the funded status of our pension plans. This could cause volatility in our benefits costs which could increase future funding requirements of our pension plans and have a negative impact on our results of operations, financial condition and cash flows. Our future funding obligations also are affected by the Pension Protection Act of 2006 (“PPA”), which established certain required funding targets. Volatility in the economic environment and/or a decline in the equity markets could cause the value of investment assets held by our pension plans to decline. As a result, we may be required to increase the amount of our cash contributions to our pension plans in order to meet the funding level requirements of the PPA. If we fail to protect the integrity and security of our information technology systems and confidential information, it could adversely affect our business. We rely upon information technology networks and systems to process, transmit and store electronic information, and to manage numerous aspects of our business and provide information to management. We also receive certain customer-specific data, including credit card information, in connection with orders placed through our various businesses, including our e-commerce websites and our retail store. The secure operation of these information technology systems, and the processing and maintenance of this information, is critical to our business operations and strategy. These systems are vulnerable to, among other things, damage and interruption from power loss or natural disasters, computer system and network failures, loss of telecommunications services, physical and electronic loss of data, security breaches, hackers and employee misuse. We may face unauthorized attempts by hackers seeking to harm us or, as a result of industrial espionage, to penetrate our network security and gain access to our systems, steal intellectual or other proprietary data, including design, sales or personally identifiable information, introduce malicious software or interrupt our internal systems, manufacturing or distribution. Though we attempt to prevent and detect these incidents, we may not be successful. Any disruption of our information technology systems, or access to or disclosure of information stored in or transmitted by our systems, could result in legal claims and damages, loss of intellectual property or other proprietary information (including customer data), disrupt operations, result in competitive disadvantage and damage our reputation, which could adversely affect our business and results of operations. In addition, states and the federal government are increasingly enacting laws and regulations to protect consumers against identity theft. Also, as our business expands globally, we are subject to data privacy and other similar laws in various foreign jurisdictions. If we are the target of a cybersecurity attack resulting in unauthorized disclosure of our customer data, we may be required to undertake costly notification procedures. Compliance with these laws will likely increase the costs of doing business. Further, if we fail to implement appropriate safeguards or to detect and provide prompt notice of unauthorized access as required by some of these laws, we could be subject to potential claims for damages and other remedies, which could harm our business. We are in the process of implementing a new enterprise resource planning system, and problems with the design or implementation of this system could interfere with our business and operations. We are engaged in a multi-year implementation of a new global enterprise resource planning system (ERP). The ERP is designed to accurately maintain the company's books and records and provide information to the company's management team important to the operation of the business. The company's ERP has required, and will continue to require, the investment of significant human and financial resources. We may not be able to successfully implement the ERP without experiencing delays, increased costs and other difficulties. If we are unable to successfully design and implement the new ERP system as planned, our financial positions, results of operations and cash flows could be negatively impacted. We may not be able to successfully integrate acquired businesses, which may result in an inability to realize the anticipated benefits of our acquisitions. •Possible tax costs or inefficiencies associated with integrating the operations of a combined company. In connection with any acquisition that we make, there may be liabilities that we fail to discover or that we inadequately assess. Acquired entities may not operate profitably or result in improved operating performance. Additionally, we may not realize anticipated synergies. If our acquisitions perform poorly, our business and financial results could be adversely affected. Tax matters, including the changes in corporate tax rates, disagreements with taxing authorities and imposing of new taxes could impact our results of operations and financial condition. Our effective tax rates, and tax payments, could be affected by numerous factors, including but not limited to entry into new geographies, changes to our existing business and operations, acquisitions, changes in our stock price, changes in our deferred tax assets and liabilities and the related valuation, and changes in relevant tax, accounting, and other laws, regulations, administrative practices, principles, and interpretations. On December 22, 2017, the U.S. government enacted comprehensive tax legislation under the Tax Cuts and Jobs Act (the "Tax Act") which represents a significant overhaul of the U.S. federal tax code. The Tax Act makes broad and complex changes to the U.S. tax code, including but not limited to reducing the U.S. federal corporate tax rate from 35% to 21%. The Tax Act requires judgments to be made in interpretation of the provisions of the Tax Act and significant estimates in the related calculations. The Department of Treasury, the Internal Revenue Service, and other standard-setting bodies have not implemented all relevant regulations or issued substantive guidance to-date; therefore, these standard-setting bodies could interpret or issue guidance on how provisions of the Tax Act will be applied that may differ from our current interpretation. We are continuing to evaluate the overall impact of this tax legislation on our operations and overall income tax position. See Note 17, Income Taxes, to the consolidated financial statements included in Item 8 for further discussion of the Tax Act. We need to comply with new, evolving or revised tax laws and regulations. The enactment of or increases in tariffs, or other changes in application or interpretation of the Tax Act, or on specific products that we sell or with which our products compete, may have an adverse effect on our business or on results of operations. Any attempt by the Administration to withdraw from or materially modify NAFTA and certain other international trade agreements could adversely affect our business, financial condition and results of operations. A significant portion of our business activities are conducted in foreign countries, including Canada and Mexico. The current Administration has made comments suggesting that certain existing international trade agreements may change, including the North American Free Trade Agreement (“NAFTA”). At this time, it remains unclear what the new Administration will or will not do with respect to these international trade agreements. If the Administration takes action to withdraw from or materially modify NAFTA or certain other international trade agreements, our business, financial condition and results of operations could be adversely affected. Our corporate documents and Delaware law contain provisions that could discourage, delay or prevent a change in control of our company. Provisions in our amended and restated certificate of incorporation and bylaws may discourage, delay or prevent a merger or acquisition involving us that our stockholders may consider favorable. For example, our amended and restated certificate of incorporation authorizes our board of directors to issue up to 10,000,000 shares of “blank check” preferred stock. Without stockholder approval, the board of directors has the authority to attach special rights, including voting and dividend rights, to this preferred stock. With these rights, preferred stockholders could make it more difficult for a third party to acquire us. In addition, our amended and restated certificate of incorporation provides for a staggered board of directors, whereby directors serve for three-year terms, with approximately one-third of the directors coming up for reelection each year. Having a staggered board will make it more difficult for a third party to obtain control of our board of directors through a proxy contest, which may be a necessary step in an acquisition of us that is not favored by our board of directors. We are also subject to the anti-takeover provisions of Section 203 of the Delaware General Corporation Law. Under these provisions, if anyone becomes an “interested stockholder,” we may not enter into a “business combination” with that person for three years without special approval, which could discourage a third party from making a takeover offer and could delay or prevent a change of control. For purposes of Section 203, “interested stockholder” means, generally, someone owning 15% or more of our outstanding voting stock or an affiliate of ours that owned 15% or more of our outstanding voting stock during the past three years, subject to certain exceptions as described in Section 203. Upon any change in control, the lenders under our credit facility would have the right to require us to repay all of our outstanding obligations under the facility. Our stock price may be volatile, and your investment in our common stock could suffer a decline in value. We operate over 3,976 thousand square feet of facilities, including manufacturing plants, warehouses and sales offices. Of these facilities, we own approximately 2,469 thousand square feet and lease approximately 1,507 thousand square feet. Our manufacturing plants are located in East Greenville, Pennsylvania, Grand Rapids and Muskegon, Michigan, Chicago, Illinois, Dallas, Texas, Toronto, Canada, and Foligno and Graffignana, Italy. The location, square footage, and use of the facilities as of December 31, 2017 are shown below. We believe that our plants and other facilities are sufficient for our needs for the foreseeable future. From time to time, we are subject to litigation or other legal proceedings arising in the ordinary course of business. Based upon information currently known to us, we believe the outcome of such proceedings will not have, individually or in the aggregate, a material adverse effect on our business, financial condition or results of operations. Our common stock has been listed on the New York Stock Exchange (“NYSE”) since December 14, 2004, the date of our initial public offering, under the symbol “KNL.” As of December 31, 2017, there were approximately 127 stockholders of record of our common stock. The following table sets forth, for the periods indicated, high and low sales prices for the common stock as reported by the NYSE. We declared and paid cash dividends of $0.60 per share for the years ended December 31, 2017 and 2016. On February 6, 2018, our board of directors declared a cash dividend of $0.15 per share on our common stock payable on March 31, 2018 to shareholders of record on March 15, 2018. The declaration and payment of future dividends is subject to the discretion of our board of directors and depends on various factors, including our net income, financial condition, cash requirements and future prospects and other factors deemed relevant by our board of directors. Our credit facility imposes restrictions on our ability to pay dividends, and thus our ability to pay dividends on our common stock will depend upon, among other things, our level of indebtedness at the time of the proposed dividend and whether we are in default under any of our debt obligations. Our ability to pay dividends will also depend on the requirements of any future financing agreements to which we may be a party. Our board of directors intends to evaluate our dividend policy quarterly in reference to these factors. 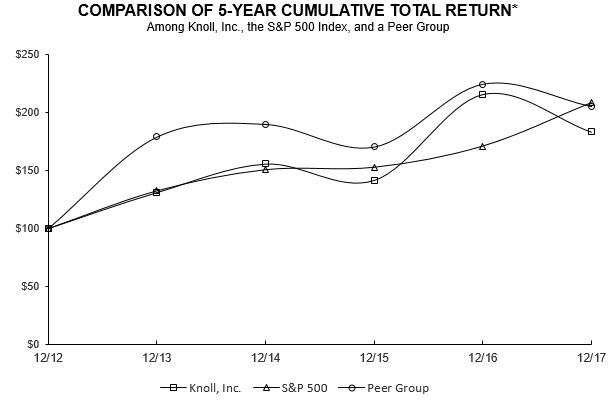 The following line graph compares the cumulative total stockholder return on our common stock with the cumulative total return of the Standard & Poor's 500 Stock Index and with the cumulative total return of a peer group of companies selected by us for the period commencing on December 31, 2012 and ending on December 31, 2017. Our share price at the beginning of the measurement period is $15.36 per share. The graph and table assume that $100 was invested on December 31, 2012 in each of our common stock, the stock of our peer group, and the S&P 500 Index, and that all dividends were reinvested. Our peer group is made up of six publicly-held companies, Herman Miller, Inc., Steelcase, Inc., HNI Corp, Kimball International Inc., Interface Inc., and Movado Group Inc. The stock performance on the graph below does not necessarily indicate future price performance. $100 invested on 12/31/12 in stock or index, including reinvestment of dividends. Fiscal year ending December 31. * The performance graph and the related chart should not be deemed filed for purposes of Section 18 of the Securities Exchange Act of 1934 or incorporated by reference into any of our filings under the Securities Act of 1933 or the Securities Exchange Act of 1934, unless we specifically incorporate the performance graph by reference therein. The following is a summary of share repurchase activity during the three months ended December 31, 2017. On August 17, 2005, our board of directors approved a stock repurchase program (the “Options Proceeds Program”), whereby they authorized us to purchase shares of our common stock in the open market using the cash proceeds received by us upon exercise of outstanding options. On February 2, 2006, our board of directors approved an additional stock repurchase program, pursuant to which we are authorized to purchase up to $50.0 million of our common stock in the open market, through privately negotiated transactions, or otherwise. On February 4, 2008, our board of directors expanded this previously authorized $50.0 million stock repurchase program by an additional $50.0 million. (1) There is no limit on the number or value of shares that may be purchased by us under the Options Proceeds Program. Under our $50.0 million stock repurchase program, which was expanded by an additional $50.0 million in February 2008, we are only authorized to spend an aggregate of $100.0 million on stock repurchases. Amounts in this column represent the amounts that remain available under the $100.0 million stock repurchase program as of the end of the period indicated. There is no scheduled expiration date for the Option Proceeds Program or the $100.0 million stock repurchase program, but our Board of Directors may terminate either program in the future. (2) In December 2017, 35,139 shares of outstanding restricted stock vested. Concurrently with the vesting, 16,548 shares were forfeited by the holders of the restricted shares to cover applicable taxes paid on the holders' behalf by the Company. The following selected consolidated financial data should be read in conjunction with “Management's Discussion and Analysis of Financial Condition and Results of Operations” and our audited consolidated financial statements and the related notes included elsewhere in this Form 10-K. The selected consolidated financial data for the years ended December 31, 2015, 2016 and 2017 and as of December 31, 2016 and 2017 are derived from our audited financial statements included elsewhere in this Form 10-K. The selected consolidated financial data for the years ended December 31, 2013 and 2014 and as of December 31, 2013, 2014 and 2015 are derived from our audited financial statements not included in this Form 10-K.
Management's discussion and analysis of financial condition and results of operations provides an account of our financial performance and financial condition that should be read in conjunction with the accompanying audited consolidated financial statements. This annual report on Form 10-K contains forward-looking statements, principally in the sections entitled “Business,” “Risk Factors,” “Management's Discussion and Analysis of Financial Condition and Results of Operations,” and “Quantitative and Qualitative Disclosures About Market Risk.” Statements and financial discussion and analysis contained in this Form 10-K that are not historical facts are forward-looking statements. These statements discuss goals, intentions and expectations as to future trends, plans, events, results of operations or financial condition, or state other information relating to us, based on our current beliefs as well as assumptions made by us and information currently available to us. Forward-looking statements generally will be accompanied by words such as “anticipate,” “believe,” “could,” “estimate,” “expect,” “forecast,” “intend,” “may,” “possible,” “potential,” “predict,” “project,” or other similar words, phrases or expressions. This includes, without limitation, our statements and expectations regarding any current or future recovery in our industry and publicly announced plans for increased capital and investment spending to achieve our long-term revenue and profitability growth goals, and our expectations with respect to leverage. Although we believe these forward-looking statements are reasonable, they are based upon a number of assumptions concerning future conditions, any or all of which may ultimately prove to be inaccurate. Important factors that could cause actual results to differ materially from the forward-looking statements include, without limitation: the risks described in Item 1A and in Item 7A of this annual report on Form 10-K; changes in the financial stability of our clients or the overall economic environment, resulting in decreased corporate spending and service sector employment; changes in relationships with clients; the mix of products sold and of clients purchasing our products; the success of new technology initiatives; changes in business strategies and decisions; competition from our competitors; our ability to recruit and retain an experienced management team; changes in raw material prices and availability; restrictions on government spending resulting in fewer sales to the U.S. government, one of our largest customers; our debt restrictions on spending; our ability to protect our patents, copyrights and trademarks; our reliance on furniture dealers to produce sales; lawsuits arising from patents, copyrights and trademark infringements; violations of environmental laws and regulations; potential labor disruptions; adequacy of our insurance policies; the availability of future capital and the cost of borrowing; the overall strength and stability of our dealers, suppliers, and customers; access to necessary capital; our ability to successfully integrate acquired businesses; the success of our design and implementation of a new enterprise resource planning system; and currency rate fluctuations. The factors identified above are believed to be important factors (but not necessarily all of the important factors) that could cause actual results to differ materially from those expressed in any forward-looking statement. Unpredictable or unknown factors could also have material adverse effects on us. All forward-looking statements included in this Form 10-K are expressly qualified in their entirety by the foregoing cautionary statements. Except as required under the Federal securities laws and the rules and regulations of the SEC, we undertake no obligation to update, amend, or clarify forward-looking statements, whether as a result of new information, future events, or otherwise. We design, manufacture, market and sell high-end commercial and residential furniture, accessories, textiles, fine leathers and designer felt for the workplace and residential markets, as well as modern outdoor furniture. We work with clients to create inspired modern interiors. Our design-driven businesses share a reputation for high-quality and sophistication offering a diversified product portfolio that endures throughout evolving trends and performs throughout business cycles. Our products are targeted at the middle to upper-end of the market where we reach customers primarily through a broad network of independent dealers and distribution partners, our direct sales force, our showrooms, and our online presence. During the last decade we have diversified our sources of revenue among our varying operating segments. During 2017, approximately 40% of our sales and 74% of our profits came from outside of our Office segment. We continue to build Knoll with an eye toward what works for our customers and shareholders: a constellation of design-driven brands and people, working together with our clients to create inspired modern interiors combined with our disciplined approach to the management of our business has resulted in the creation of a singular entity. Over time we believe our diversification efforts and strategy will continue to result in a more profitable and less cyclical enterprise. Knoll brands span commercial and residential applications with high design opportunities, and are heavily influenced by architect and designer specifiers. We are focused on targeting under-penetrated and emerging ancillary categories and markets as well as expanding our reach into residential and decorator channels around the world. Our efforts to diversify our sources of revenue among our operating segments has not detracted from our continued focus on growing and improving the operating performance of our Office segment. We are looking beyond the traditional office product categories of systems, task seating and storage, to furniture that supports activity areas and the in-between spaces where people meet. We believe that our success in traditional office products gives us an advantage throughout the workplace. Our new Rockwell Unscripted collection encompasses every product category ranging from seating and lounge to architectural walls and storage. It addresses the needs of organizations that seek alternatives to the traditional workspace, and is substantially additive to our current product portfolio. In addition to these initiatives, we aim to increase profitability through operational improvements and investments in our physical and technological infrastructure. We are committed to building a more efficient and responsive customer centric service culture and technology infrastructure across our organization. Our capital expenditures are reflective of this commitment as we continued to invest in the business through technology infrastructure upgrades, continued investments in our manufacturing facilities focusing on lean initiatives and showroom presence. Net sales for the year ended December 31, 2017 were $1,132.9 million, a decrease of $31.4 million, or 2.7%, from sales of $1,164.3 million for the year ended December 31, 2016. The decrease in sales was largely due to a $48.3 million decrease in Office sales driven by volume declines in both government and commercial sales, primarily in the first half of the year. The decrease in Office segment sales was partially offset by an increase in Studio segment sales. Studio sales increased $17.6 million, due primarily to growth from HOLLY HUNT® and Knoll Europe, as well as incremental sales from a full year of DatesWeiser acquired in December 2016. Gross profit for 2017 was $414.6 million, a decrease of $31.4 million, or 7.0%, from gross profit of $446.0 million in 2016. As a percentage of sales, gross profit decreased from 38.3% for 2016 to 36.6% for 2017. This decline is due primarily to lower fixed-cost leverage resulting from lower volume in the Office segment, as well as higher commodity inflation. Operating profit for 2017 was $88.0 million, a decrease of $48.3 million, or 35.5%, from operating profit of $136.3 million for 2016. Operating profit as a percentage of sales decreased from 11.7% in 2016 to 7.8% in 2017. Selling, general, and administrative expenses for 2017 were $306.0 million, or 27.0% of sales, compared to $309.7 million, or 26.6% of sales, for 2016. In addition to selling, general and administrative expenses, operating expenses for 2017 included an asset impairment of $16.3 million, a pension settlement charge of $2.2 million, restructuring charges of $2.2 million, and acquisition costs of $0.5 million. The decrease in selling, general and administrative expenses was primarily related to lower incentive compensation due to decreased profitability, partially offset by increased sales headcount. Interest expense for 2017 was $7.5 million, an increase of $2.1 million from $5.4 million for 2016. The increase in interest expense was due primarily to a higher average outstanding debt balance, and increased interest rates during 2017. During 2017 and 2016, the Company's weighted average interest rates were approximately 2.4% and 2.0%, respectively. Other expense in 2017 was $1.9 million compared to $3.4 million in 2016. Other expense in 2017 was related primarily to foreign exchange losses that resulted from the revaluation of intercompany balances between our US and foreign entities in both 2017 and 2016. The effective tax rate for 2017 was (2.0%) compared to 35.6% for 2016. The primary driver of the lower effective tax rate in 2017 was a $26.6 million benefit resulting from the impacts of the Tax Cuts and Jobs Act of 2017 ("Tax Act") being signed into law in December of 2017. Additional factors impacting the rate included the vesting of a large quantity of equity awards during the first quarter of 2017, and the reversal in the third quarter of 2017 of a valuation allowance against certain foreign jurisdiction deferred tax assets. In addition, our effective tax rate is directly affected by the mix of pretax income and the varying effective tax rates in the countries and states in which we operate. Net sales for the year ended December 31, 2016 were $1,164.3 million, an increase of $59.9 million, or 5.4%, from sales of $1,104.4 million for the year ended December 31, 2015. The increase in sales was largely due to a $44.4 million increase in Office sales driven by continued growth in our core systems portfolio as well as an increase in complimentary products. While Coverings segment sales were slightly down compared to prior year, Studio segment sales increased $19.6 million, led by KnollStudio in North America and Europe. Gross profit for 2016 was $446.0 million, an increase of $33.8 million, or 8.2%, from gross profit of $412.1 million in 2015. Gross profit for 2015 includes a charge of $0.9 million due to the discontinuation of one of our seating products. As a percentage of sales, gross profit increased from 37.3% for 2015 to 38.3% for 2016. The improvement was driven mainly by the Office and Studio segments, where operating efficiencies and improved fixed-cost leverage from higher volumes were favorable. Operating profit for 2016 was $136.3 million, an increase of $35.2 million, or 34.8%, from operating profit of $101.1 million for 2015. Operating profit as a percentage of sales increased from 9.2% in 2015 to 11.7% in 2016. Operating profit for 2015 includes $11.5 million of restructuring and impairment charges. Selling, general, and administrative expenses for 2016 were $309.7 million, or 26.6% of sales, compared to $299.5 million, or 27.1% of sales, for 2015. Operating expenses for 2015 include an Edelman tradename impairment of $10.7 million, as well as restructuring charges of $0.9 million. The increase in operating expenses was primarily related to expanded sales, marketing and product development investments as well as additional headcount. Interest expense for 2016 was $5.4 million, a decrease of $1.5 million from interest expense of $6.9 million for 2015. The decrease in interest expense was due primarily to a reduction in outstanding debt. During 2016 and 2015, the Company's weighted average interest rates were approximately 2.0% and 2.1%, respectively. Other expense in 2016 was $3.4 million compared to other income of $9.2 million in 2015. Other expense in 2016 was related primarily to foreign exchange losses that resulted from the revaluation of intercompany balances between our Canadian and US entities. Other income in 2015 was due primarily to foreign exchange gains on intercompany balances. Our effective tax rate was 35.6% for 2016, compared to 36.2% for 2015. The mix of pretax income and the varying effective tax rates in the countries and states in which we operate directly affects our consolidated effective tax rate. We manage our business through our reporting segments: Office, Studio, and Coverings. All unallocated expenses are included within Corporate. Our Office segment includes a complete range of workplace products that address diverse workplace planning paradigms. These products include: systems furniture, seating, storage, tables, desks and KnollExtra® accessories as well as the international sales of our North American Office products. Our Studio segment includes KnollStudio®, HOLLY HUNT®, Knoll Europe and DatesWeiser. KnollStudio products, include iconic seating, lounge furniture, side, cafe and dining chairs as well as conference, training and dining and occasional tables. HOLLY HUNT® is known for high quality residential furniture, lighting, rugs, textiles and leathers. In addition, HOLLY HUNT® also includes Vladimir Kagan Design Group, a renowned collection of modern luxury furnishings. Knoll Europe, which distributes both KnollStudio and Knoll Office products, manufactures and sells products to customers primarily in Europe. DatesWeiser, known for its sophisticated meeting and conference tables and credenzas, sets a standard for design, quality and technology integration. Our Coverings segment includes KnollTextiles®, Spinneybeck® (including Filzfelt®), and Edelman® Leather. These businesses provide a wide range of customers with high-quality fabrics, felt, leather and related architectural products. See Note 20 of our consolidated financial statements contained in this annual report on Form 10-K for further information regarding the business segments. The comparisons of segment results found below present our segment information with Corporate costs excluded from operating segment results. (1) The Company does not allocate interest expense or other (income) expense, net to the reportable segments. Net sales for the Office segment in 2017 were $682.9 million, a decrease of $48.4 million, or 6.6%, when compared with 2016. This decrease in the Office segment for the year was due to declines in both government and commercial sales, primarily in the first half of the year. Operating profit for the Office segment in 2017 was $25.9 million, a decrease of $48.0 million, or 64.9%, when compared with 2016. The decrease in operating profit was primarily due to infrequent charges of $21.2 million which includes a $16.3 million asset impairment charge, a $2.2 million pension settlement charge, a $2.2 million restructuring charge and acquisition costs of $0.5 million. Net sales for the Studio segment in 2017 were $341.0 million, an increase of $17.6 million, or 5.4%, when compared with 2016. The increase in the Studio segment was due primarily to growth from HOLLY HUNT® and Knoll Europe, as well as incremental sales from a full year of DatesWeiser. Operating profit for the Studio segment in 2017 was $51.1 million, a decrease of $2.3 million, or 4.3%, when compared with 2016. Net sales for the Coverings segment in 2017 were $109.0 million, a decrease of $0.6 million, or 0.5%, when compared with 2016. Continued year-over-year growth in Spinneybeck | FilzFelt sales, particularly in the architectural space, was offset by lower volume at KnollTextiles and Edelman. Operating profit for the Coverings segment in 2017 was $24.6 million, a decrease of $1.3 million, or 5.1%, when compared with 2016. Corporate costs in 2017 were $13.7 million, a decrease of $3.2 million, or 15.1%, when compared with 2016. The decrease was driven primarily by reduced costs associated with employee benefits and incentive compensation expense in 2017. Net sales for the Office segment in 2016 were $731.3 million, an increase of $44.4 million, or 6.5%, when compared with 2015. This increase in the Office segment for the year was led by continued growth in our core systems portfolio, as well as increases in complementary products. Operating profit for the Office segment in 2016 was $73.9 million, an increase of $18.0 million, or 32.3%, when compared with 2015. The increase in operating profit was driven by continuous improvement efficiencies and leveraging our fixed cost structure from higher volume. Operating profit for the Office segment in 2015 includes a $0.9 million seating product discontinuation charge and $0.5 million restructuring charges. Net sales for the Studio segment in 2016 were $323.4 million, an increase of $19.6 million, or 6.4%, when compared with 2015. The increase in the Studio segment was driven by higher sales at KnollStudio in North America and by our European business unit. Operating profit for the Studio segment in 2016 was $53.4 million, an increase of $5.5 million, or 11.4%, when compared with 2015. The increase in operating profit was driven by increased sales volume and net price realization. Operating profit for the Studio segment in 2015 includes a $0.4 million restructuring charge. Net sales for the Coverings segment in 2016 were $109.5 million, a decrease of $4.1 million, or 3.6%, when compared with 2015. Continued year-over-year growth in Spinneybeck | FilzFelt sales was offset by lower volume at KnollTextiles and Edelman. Operating profit for the Coverings segment in 2016 was $26.0 million, an increase of $8.7 million, or 50.3%, when compared with 2015. Operating profit for the Coverings segment in 2015 includes a $10.7 intangible asset impairment charge. Corporate costs in 2016 were $16.9 million, a decrease of $3.0 million, or 15.1%, when compared with 2015. The decrease was driven primarily by the full year pension benefits recognized in 2016 as a result of our 2015 pension curtailment actions, partially offset by higher salary expense related to additional headcount. We have historically funded our business through cash generated from operations, supplemented by debt borrowings. Available cash is primarily used for our working capital needs, ongoing operations, capital expenditures, the payment of quarterly dividends, and the repurchase of shares. Our investment in capital expenditures shows our commitment to improving our operating efficiency, innovation and modernization, showroom investment, new product tooling, manufacturing equipment and technology infrastructure. During 2017, we made annual dividend payments of $0.60 per share, returning $29.0 million of cash to our shareholders. In addition to our quarterly dividend payments, we also paid accrued dividends on vested shares of $1.1 million. Cash provided by operating activities was $103.7 million, $104.3 million, and $88.9 million in 2017, 2016 and 2015, respectively. For the year ended December 31, 2017, cash provided by operating activities consisted primarily of $80.2 million of net income and $38.0 million of various non-cash charges, including $26.6 million of depreciation and amortization, a $16.3 million asset impairment charge, and $9.6 million of stock based compensation, offset by $14.5 million of unfavorable changes in assets and liabilities primarily driven by $26.6 million benefit in current and deferred income taxes as a result of the 2017 Tax Cut and Jobs Act. For the year ended December 31, 2016, cash provided by operating activities consisted primarily of $82.1 million of net income and $69.0 million of various non-cash charges, including $26.0 million of deferred taxes driven by discretionary pension funding, $23.0 million of depreciation and amortization, and $10.5 million of stock based compensation, offset by $46.8 million of unfavorable changes in assets and liabilities primarily driven by our discretionary pension plan contribution during the year of $53.2 million. For the year ended December 31, 2017, we used $40.6 million of cash for capital expenditures. During 2016, we used $40.1 million and $18.5 million of cash for capital expenditures and the purchase of businesses, respectively. The capital expenditures are reflective of our commitment to enhance and modernize our sales, manufacturing and information technology infrastructure. Acquisitions are reflective of our strategy of building our global capabilities as a singular resource for high-design workplaces and homes. For the year ended December 31, 2017, we used cash of $30.2 million to fund dividend payments to shareholders, $10.9 million for share repurchases associated with the repurchase of shares used to offset the cost of employee tax withholdings, and $6.0 million of a contingent purchase price payment related to an earn-out for the HOLLY HUNT acquisition in 2014. For the year ended December 31, 2016 we used cash of $29.2 million to fund dividend payments to shareholders, $5.5 million for share repurchases associated with the repurchase of shares used to offset the cost of employee tax withholdings, and $5.0 million of a contingent purchase price payment related to the earn-out for the HOLLY HUNT acquisition. As of December 31, 2017, we were in compliance with all covenants and conditions in our Existing Credit Facility and are currently in compliance with all covenants and conditions under our Amended Credit Agreement. We believe that existing cash balances and internally generated cash flows, together with borrowings available under our credit facility, will be sufficient to fund working capital needs, capital spending requirements, debt service requirements and dividend payments for at least the next twelve months. Future debt payments may be paid out of cash flows from operations, from future refinancing of our debt or from equity issuance. On January 23, 2018, we amended and extended our Existing Credit Facility, dated May 20, 2014, with a new $750.0 million credit facility maturing on January 23, 2023. We use our credit facility in the ordinary course of business to fund our working capital needs and, at times, make significant borrowings and repayments under the facility depending on our cash needs and availability at such time. Borrowings under the Amended Credit Agreement may be repaid at any time, but no later than January 23, 2023. The Amended Credit Agreement requires that we comply with two financial covenants, consolidated leverage ratio, defined as the ratio of total indebtedness to consolidated EBITDA (as defined in our credit agreement) and consolidated interest coverage ratio, defined as the ratio of our consolidated EBITDA (as defined in our credit agreement) to our consolidated interest expense. Our consolidated leverage ratio cannot exceed 4.25 to 1, an increase from our Existing Credit Facility at December 31, 2017 of 4.0 to 1, and our consolidated interest coverage ratio must be a minimum of 3.0 to 1. However, because of the financial covenant mentioned above, our capacity under our credit facility could be reduced if our trailing consolidated EBITDA (as defined by our credit agreement) declines due to deteriorating market conditions or poor performance. We are also required to comply with various other affirmative and negative covenants including, without limitation, covenants that prevent or restrict our ability to pay dividends, engage in certain mergers or acquisitions, make certain investments or loans, incur future indebtedness, engage in sale-leaseback transactions, alter our capital structure or line of business, prepay subordinated indebtedness, engage in certain transactions with affiliates and sell stock or assets. (a) Contractual obligations for long-term debt and short-term borrowings include principal and interest payments. Interest payments have been computed based on an estimated variable interest as of December 31, 2017. The estimated variable interest rate is based on the company's expected consolidated leverage ratio and the forecasted LIBOR rate for each period presented. The computation of interest, as included in the above table, is based on our Existing Credit Facility. See Notes to Consolidated Financial Statements, Note 21, Subsequent events, for information related to the Amended Credit Agreement entered into in January 2018. (b) Due to the uncertainty of future cash outflows, contributions to the pension and other post-employment benefit plans subsequent to 2018 have been excluded from the table above. (c) Other liabilities consists of contingent payouts due to DatesWeiser, which is based on the future performance of the businesses. * Due to the uncertainty of future cash outflows, uncertain tax positions have been excluded from the table above. Our past and present business operations and the past and present ownership and operation of manufacturing plants on real property are subject to extensive and changing federal, state, local and foreign environmental laws and regulations, including those relating to discharges to air, water and land, the handling and disposal of solid and hazardous waste and the cleanup of properties affected by hazardous substances. As a result, we are involved from time-to-time in administrative and judicial proceedings and inquiries relating to environmental matters and could become subject to fines or penalties related thereto. We cannot predict what environmental legislation or regulations will be enacted in the future, how existing or future laws or regulations will be administered or interpreted or what environmental conditions may be found to exist. Compliance with more stringent laws or regulations, or stricter interpretation of existing laws, may require additional expenditures by us, some of which may be material. We have been identified as a potentially responsible party pursuant to the Comprehensive Environmental Response, Compensation and Liability Act of 1980 (“CERCLA”) for remediation costs associated with waste disposal sites that we previously used. The remediation costs and our allocated share at some of these CERCLA sites are unknown. We may also be subject to claims for personal injury or contribution relating to CERCLA sites. We reserve amounts for such matters when expenditures are probable and reasonably estimable. We do not currently have any relationships with unconsolidated entities or financial partnerships, such as entities often referred to as structured finance or special-purpose entities, which would have been established for the purpose of facilitating off-balance sheet arrangements or other contractually narrow or limited purposes. In addition, we do not engage in trading activities involving non-exchange-traded contracts. As a result, we are not materially exposed to any financing, liquidity, market or credit risk that could arise if we had engaged in these relationships. The preparation of our consolidated financial statements in conformity with accounting principles generally accepted in the U.S. (“GAAP”) requires us to make estimates and assumptions that affect the reported amounts in the consolidated financial statements and accompanying notes. Actual results may differ from such estimates. We believe that the critical accounting policies that follow are those policies that require the most judgment, estimation and assumption in preparing our consolidated financial statements. We maintain allowances for doubtful accounts for estimated losses resulting from the inability of our clients and dealers to make required payments. The allowance is determined through an analysis of the aging of accounts receivable and assessments of risk that are based on historical trends. We evaluate the past-due status of our trade receivables based on contractual terms of sale. If the financial condition of our customers were to deteriorate, additional allowances may be required. Accounts receivable are charged against the allowance for doubtful accounts when we determine that the likelihood of recovery is remote, and we no longer intend to expend resources to attempt collection. Inventories are valued at the lower of cost or market. Cost is determined using the first-in, first-out method. We reserve inventory that, in our judgment, is impaired or obsolete. Obsolescence may be caused by the discontinuance of a product line, changes in product material specifications, replacement products in the marketplace and other competitive influences. We record the excess of purchase price over the fair value of the tangible and identifiable intangible assets acquired as goodwill. Goodwill and intangible assets with indefinite lives are tested for impairment at least annually, as of October 1, and whenever events or circumstances occur indicating that a possible impairment may have been incurred. Intangible assets with finite lives are amortized over their useful lives. We assess whether goodwill impairment exists using both the qualitative and quantitative assessments. The qualitative assessment involves determining whether events or circumstances exist that indicate it is more likely than not that the fair value of a reporting unit is less than its carrying amount, including goodwill. If based on this qualitative assessment we determine it is not more likely than not that the fair value of a reporting unit is less than its carrying amount or if we elect not to perform a qualitative assessment, a quantitative assessment is performed to determine whether a goodwill impairment exists at the reporting unit. We compare the fair value of each reporting unit to its carrying value and if the fair value of the reporting unit exceeds its carrying value, goodwill is not impaired and no further testing is required. If the fair value of the reporting unit is less than the carrying value, the difference is recorded as an impairment loss. We estimate the fair value of its reporting units using a combination of the fair values derived from both the income approach and the market approach. Under the income approach, we calculate the fair value of a reporting unit based on the present value of estimated future cash flows. Cash flow projections are based on our estimates of revenue growth rates and operating margins, taking into consideration industry and market conditions. The discount rate used to determine the present value of future cash flows is based on the weighted-average cost of capital adjusted for the relevant risk associated with business-specific characteristics and the uncertainty related to the business's ability to execute on the projected cash flows. The market approach estimates fair value based on market multiples of revenue and earnings derived from comparable publicly-traded companies with similar operating and investment characteristics as the reporting unit. We assess whether indefinite-lived intangible assets impairment exists using both the qualitative and quantitative assessments. The qualitative assessment involves determining whether events or circumstances exist that indicate it is more likely than not that the fair value of an indefinite-lived intangible asset is less than its carrying amount. If based on this qualitative assessment, we determine it is more likely than not that the fair value of an indefinite-lived intangible asset is less than its carrying amount or if we elect not to perform a qualitative assessment, a quantitative assessment is performed to determine whether an indefinite-lived intangible asset impairment exists. We test the indefinite-lived intangible assets for impairment by comparing the carrying value to the fair value based on current revenue projections of the related operations, under the relief from royalty method. Any excess of the carrying value over the amount of fair value is recognized as an impairment. Any such impairment would be recognized in full in the reporting period in which it has been identified. Based on the results of the annual impairment test as of October 1, 2017, we determined there were no indications of impairment for goodwill or indefinite-lived intangible assets. The purchase price of an acquired company is allocated between tangible and intangible assets acquired and liabilities assumed from the acquired business based on their estimated fair values with the residual of the purchase price recorded as goodwill. The results of operations of the acquired businesses are included in our operating results from the dates of acquisition. We generally offer a warranty for our products. The specific terms and conditions of those warranties vary depending upon the product. We estimate the costs that may be incurred under our warranties and record a liability in the amount of such costs at the time product revenue is recognized. Factors that affect our warranty liability include historical product-failure experience and estimated repair costs for identified matters. We periodically assess the adequacy of our recorded warranty liabilities and adjust the amounts as necessary. We sponsor two defined benefit pension plans and two other post-employment benefit plans (“OPEB”). Several statistical and other factors, which attempt to anticipate future events, are used in calculating the expense and liability related to the plans. Key factors include assumptions about the expected rates of return on plan assets, discount rates, and health care cost trend rates. We consider market and regulatory conditions, including changes in investment returns and interest rates, in making these assumptions. We determine the expected long-term rate of return on plan assets based on aggregating the expected rates of return for each component of the plan's asset mix. We use historic plan asset returns combined with current market conditions to estimate the rate of return. The expected rate of return on plan assets is a long-term assumption and generally does not change annually. The discount rate reflects the market rate for high-quality fixed income debt instruments as of our annual measurement date and is subject to change each year. Holding all other assumptions constant, a one-percentage-point increase or decrease in the assumed rate of return on plan assets would decrease or increase 2017 net periodic pension expense by approximately $2.6 million. Likewise, a one-percentage-point increase or decrease in the discount rate would increase or decrease 2017 net periodic pension expense by approximately $0.6 million or $1.2 million, respectively. Unrecognized actuarial gains and losses are recognized over the expected remaining lifetime of the plan participants. Unrecognized actuarial gains and losses arise from several factors, including experience and assumption changes with respect to the obligations and from the difference between expected returns and actual returns on plan assets. These unrecognized gains and losses are systematically recognized as a change in future net periodic pension expense in accordance with the appropriate accounting guidance relating to defined benefit pension and OPEB plans. As of December 31, 2015, we changed the method used to estimate the interest cost component of net periodic benefit cost for pension and other post-employment benefits. This change resulted in a decrease in the interest cost component for 2016, compared to the previous method. Historically, we estimated the interest cost component utilizing a single weighted-average discount rate derived from the yield curve used to measure the benefit obligation at the beginning of the period. We have elected to utilize a full yield curve approach in the estimation of this component by applying the specific spot rates along the yield curve used in the determination of the benefit obligation to the relevant projected cash flows. We have made this change to provide a more precise measurement of interest cost by improving the correlation between projected benefit cash flows to the corresponding spot yield curve rates. Key assumptions that we use in determining the amount of the obligation and expense recorded for OPEB, under the appropriate accounting guidance, include the assumed discount rate and the assumed rate of increases in future health care costs. In estimating the health care cost trend rate, we consider actual health care cost experience, future benefit structures, industry trends and advice from our actuaries. We assume that the relative increase in health care costs will generally trend downward over the next several years, reflecting assumed increases in efficiency and cost-containment initiatives in the health care system. For purposes of measuring the benefit obligation associated with the Company's OPEB plans as of December 31, 2017, as well as the assumed rate for 2018, a between 5.60 - 7.20% annual rate of increase in the per capita cost of covered health care benefits was assumed and a 10.10% annual rate of increase in the per capita cost of covered prescription drug benefits was assumed. The rate was then assumed to decrease to an ultimate rate of 4.50% for 2025 and thereafter for the medical plan and prescription drug plan and thereafter for the benefit obligation. Increasing the assumed health care cost trend by one-percentage-point in each year would increase the benefit obligation as of December 31, 2017 by $0.01 million and increase the aggregate of the service and interest cost components of net periodic benefit cost for 2017 by a minimal amount. Decreasing the assumed health care cost trend rate by one percentage point in each year would decrease the benefit obligation as of December 31, 2017 by approximately $0.01 million and decrease the aggregate of the service and interest cost components of net periodic benefit cost for 2017 by a minimal amount. In accordance with the appropriate accounting guidance, we recognize in our consolidated balance sheet the funded status (i.e., the difference between the fair value of plan assets and the projected benefit obligation) of our defined benefit pension and OPEB plans. To record the unfunded status of our plans, we recorded an additional liability and an adjustment to accumulated other comprehensive income, net of tax. The actuarial assumptions we use in determining our pension and OPEB retirement benefits may differ materially from actual results due to changing market and economic conditions, higher or lower withdrawal rates, or longer or shorter life spans of participants. While we believe that the assumptions used are appropriate, differences in actual experience or changes in assumptions may materially affect our financial position or results of operations. We establish reserves for the estimated cost of environmental and legal contingencies when such expenditures are probable and reasonably estimable. A significant amount of judgment is required to estimate and quantify our ultimate exposure in these matters. We engage outside experts as deemed necessary or appropriate to assist in the evaluation of exposure. From time to time, as information becomes available regarding changes in circumstances for ongoing issues as well as information regarding emerging issues, our potential liability is reassessed and reserve balances are adjusted as necessary. Revisions to our estimates of potential liability, and actual expenditures related to commitments and contingencies, could have a material impact on our results of operations or financial position. We account for income taxes in accordance with the appropriate accounting guidance relating to income taxes, which requires that deferred tax assets and liabilities be recognized using enacted tax rates for the effect of temporary differences between book and tax bases of recorded assets and liabilities. The appropriate accounting guidance also requires that deferred tax assets be reduced by a valuation allowance if it is more likely than not that some portion or all of the deferred tax assets will not be recognized. On December 22, 2017, the U.S. government enacted comprehensive tax legislation under the Tax Cuts and Jobs Act (the “Tax Act”). The Tax Act makes broad and complex changes to the U.S. tax code, including but not limited to reducing the U.S. federal corporate tax rate from 35% to 21%. The Tax Act requires judgments to be made in interpretation of the provisions of the Tax Act and significant estimates in the related calculations. The Department of Treasury, the Internal Revenue Service, and other standard-setting bodies have not implemented all relevant regulations or issued substantive guidance to-date; therefore, they could interpret or issue guidance on how provisions of the Tax Act will be applied that is different from our current interpretation. Furthermore, on December 22, 2017, SEC staff issued Staff Accounting Bulletin No. 118, Income Tax Accounting Implications of the Tax Cuts and Jobs Act (“SAB 118”) that allows registrants to record provisional amounts during a measurement period, which is not to extend beyond one year. Accordingly, amounts recorded may require further adjustments due to evolving analysis and interpretations of law and regulations, including interpretations of how accounting for income taxes should be applied. Consistent with SAB 118, we were able to make reasonable estimates and we have incorporated provisional amounts for the impact of the Tax Act. At December 31, 2017, our deferred tax liabilities of $82.7 million exceeded deferred tax assets of $28.1 million by $54.5 million. At December 31, 2016, deferred tax liabilities of $121.7 million exceeded deferred tax assets of $44.9 million by $77.0 million. The decrease in deferred tax liabilities is primarily related to the impact of the Tax Act, resulting in a $26.6 million impact on our deferred tax balances in the fourth quarter of 2017. Our deferred tax assets at December 31, 2017 and 2016 of $28.1 million and $44.9 million, respectively, are net of valuation allowances of $4.8 million and $6.2 million, respectively. We have recorded the valuation allowance primarily for net operating loss carryforwards in foreign tax jurisdictions where we have incurred historical tax losses from operations or acquired tax losses through acquisition, and have determined that it is more likely than not that these deferred tax assets will not be realized. We evaluate on an ongoing basis the realizability of our deferred tax assets and adjust the amount of the allowance, if necessary. The factors used to assess the likelihood of realization include our forecast of future taxable income and our assessment of available tax planning strategies that could be implemented to realize the net deferred tax assets. We account for uncertain tax positions in accordance with the applicable accounting guidance relating to uncertainty in income taxes. Accordingly, we report a liability for unrecognized tax benefits resulting from uncertain tax positions taken, or expected to be taken, in an income tax return. We recognize interest and penalties, if any, related to unrecognized tax benefits in income tax expense. From time to time, we enter into foreign currency forward exchange contracts and foreign currency option contracts to manage our exposure to foreign exchange rates. The terms of these contracts are less than a year. We measure the cost of employee services received in exchange for an award of equity instruments based on the grant-date fair value of the award. We recognize compensation expense using the straight-line method over the vesting period. Compensation expense relating to restricted stock units that are subject to performance conditions is recognized if it is probable that the performance condition will be achieved. Forfeitures are recognized when they occur. The fair value of stock options is estimated at the date of grant using the Black-Scholes option pricing model, which requires management to make certain assumptions of future expectations based on historical and current data. The assumptions include the expected term of the options, risk-free interest rate, expected volatility, and dividend yield. The expected term represents the expected amount of time that options granted are expected to be outstanding, based on historical and forecasted exercise behavior. The risk-free rate is based on the rate at grant date of zero-coupon U.S. Treasury Notes with a term equal to the expected term of the option. Expected volatility is estimated based on the historical volatility of our stock price. Our dividend yield is based on historical data. The fair value of restricted stock and restricted stock units, excluding market-based restricted stock units is based upon the closing market price of our common stock on the date of grant. The fair value of the market-based restricted stock units is estimated at the date of grant using a Monte Carlo simulation model, which requires management to make certain assumptions based on both historical and current data. These awards vest based upon the performance of our stock price relative to a peer group. The assumptions included in the model include, but are not limited to, risk-free interest rate, expected volatility of our and the peer group's stock prices, and dividend yield. The risk-free rate is based upon the applicable U.S. Treasury Note rate. Expected volatility is estimated based on the historical volatility of our stock prices. The dividend yield is based on our historical data. During the normal course of business, we are routinely subjected to market risk associated with interest rate movements and foreign currency exchange rate movements. Interest rate risk arises from our debt obligations. Foreign currency exchange rate risk arises from our non-U.S. operations and purchases of inventory from foreign suppliers. We also have risk in our exposure to certain materials and transportation costs. Steel, leather, wood products and plastics are all used in our products. For the year ended December 31, 2017, we estimated that materials inflation was approximately $6.7 million and transportation inflation was approximately $1.0 million. During 2016, we estimated that materials and transportation inflation were approximately $0.7 million and $0.1 million, respectively. We continue to work to offset price increases in raw materials and transportation through our global sourcing initiatives, cost improvements and price increases to our products. We have variable rate debt obligations that are denominated in U.S. dollars. A change in interest rates will impact the interest costs incurred and cash paid on the variable rate debt. During 2017 and 2016, our weighted average interest rates were approximately 2.4% and 2.0%, respectively. The following table summarizes our market risks associated with our debt obligations as of December 31, 2017. For debt obligations, the table presents principal cash flows and related average interest rates by year of maturity. Variable interest rates presented for variable-rate debt represent the average interest rates on our credit facility borrowings as of December 31, 2017. See Notes to Consolidated Financial Statements, Footnote 21. Subsequent events for information related to the Amended Credit Agreement entered into in January 2018. The fair value of the Company's long-term debt approximates its carrying value, as the variable rate debt and the associated terms are comparable to market terms as of the balance sheet date. For each period presented, the average interest rate is based on an estimated variable interest rate as of December 31, 2017. The estimated variable interest rate is based on the Company's expected consolidated leverage ratio, and the forecasted LIBOR rate and commitment fees for each period presented. The computation of interest, as included in the above table, is based on our Amended and Restated Credit Agreement, dated May 20, 2014. An increase in our effective interest rate of 1% would increase annual interest expense by approximately $1.9 million. We will continue to review our exposure to interest rate fluctuations and evaluate whether we should manage such exposure through derivative transactions. We manufacture our products in the United States, Canada and Italy, and sell our products primarily in those markets as well as in other European countries. Our foreign sales and certain expenses are transacted in foreign currencies. Our production costs, profit margins and competitive position are affected by the strength of the currencies in countries where we manufacture or purchase goods relative to the strength of the currencies in countries where our products are sold. Additionally, as our reporting currency is the U.S. dollar, our financial position is affected by the strength of the currencies in countries where we have operations relative to the strength of the U.S. dollar. The principal foreign currencies in which we conduct business are the Canadian dollar and the Euro. Approximately 12.6% and 11.4% of our revenues in 2017 and 2016, respectively, and 25.9% and 26.6% of our cost of goods sold in 2017 and 2016, respectively, were denominated in currencies other than the U.S. dollar. Foreign currency exchange rate fluctuations resulted in $1.8 million of translation losses and $3.7 million of translation losses for 2017 and 2016, respectively. From time to time, we enter into foreign currency hedges to manage our exposure to foreign exchange rates. The terms of these contracts are typically less than a year. Changes in the fair value of such contracts are reported in earnings in the period the value of the contract changes. The net gain or loss upon settlement and the change in fair value of outstanding contracts is recorded as a component of other expense (income). To the Stockholders and the Board of Directors of Knoll, Inc.
We have audited the accompanying consolidated balance sheets of Knoll, Inc. (the Company) as of December 31, 2017 and 2016, the related consolidated statements of operations and comprehensive income, equity and cash flows for each of the three years in the period ended December 31, 2017, and the related notes and financial statement schedule listed in the Index at Item 15(a) (collectively referred to as the “consolidated financial statements”). In our opinion, the consolidated financial statements present fairly, in all material respects, the financial position of the Company at December 31, 2017 and 2016, and the results of its operations and its cash flows for each of the three years in the period ended December 31, 2017, in conformity with U.S. generally accepted accounting principles. We also have audited, in accordance with the standards of the Public Company Accounting Oversight Board (United States) (PCAOB), the Company's internal control over financial reporting as of December 31, 2017, based on criteria established in Internal Control-Integrated Framework issued by the Committee of Sponsoring Organizations of the Treadway Commission (2013 framework) and our report dated February 27, 2018 expressed an unqualified opinion thereon. We have served as the Company‘s auditor since 1996.